In production environment the logs of applications are important, we need to store them for compliance reasons and make sure that the log files dont fill up the disk space. 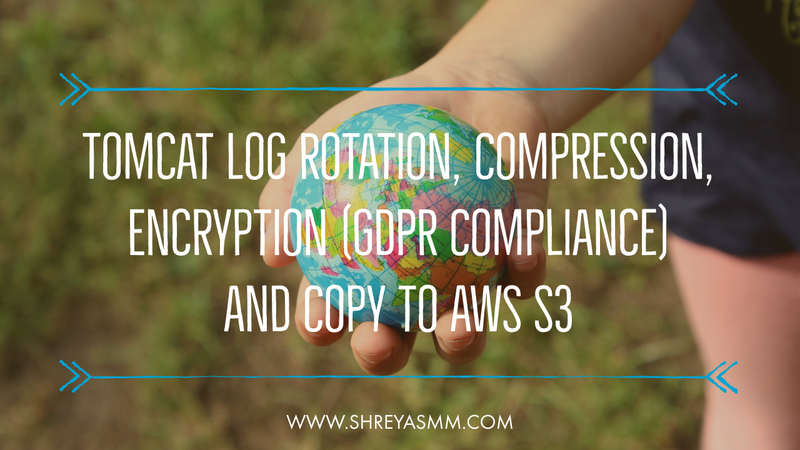 Since the EU GDPR Privacy law has been passed, the log files need to be encrypted. I am running Tomcat 9 and CATALINA_HOME=/opt/tomcat. You can install Tomcat 9 from here. Tomcat rotates the logs by itself in a default setup. which is configured in /opt/tomcat/conf/logging.properties file. we need explicitly configure tomcat to not to rotate the log files like catalina.out itself, since we will be rotating and compressing them using system logrotate utility. I have added one line to each log entry org.apache.juli.AsyncFileHandler.rotatable = false to stop rotation of logs by tomcat, Once this is done tomcat will not rotate the logs by itself. its just going to do gzip -9 filename , which compresses the file. copytruncate – copies the log file to new file and truncates the log file to zero bytes. create 0644 tomcat tomcat – create the log file with these permissions, ignored if copy truncate is used. postrotate – command to run after the log rotation. Encrypt command will get list of files in given location and if the file has .gz extention the it will encrypt it with gpg (GNU Privacy Guard), move all the encrypted files which has .gpg extention to aws s3 bucket and once uploaded it will delete the encrypted file from that location. For copying the encrypted logs to S3 make sure that the ec2 instance has write to S3 IAM Access Role assigned to it.